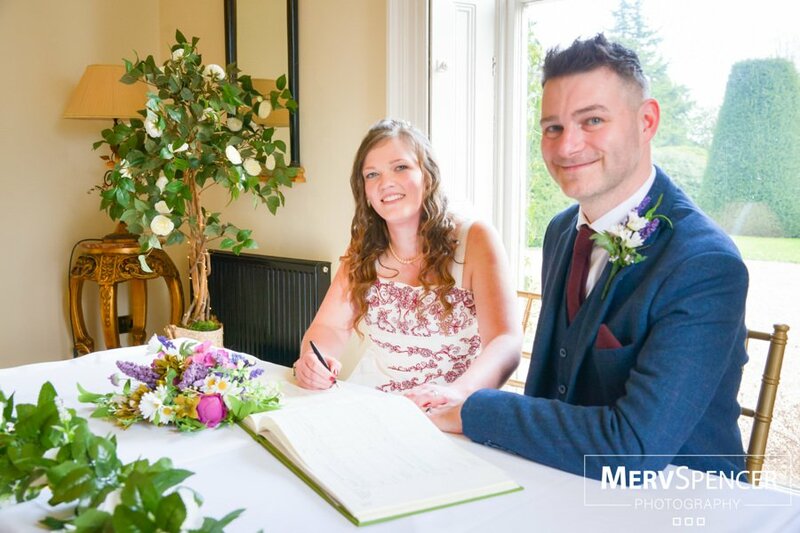 When Laura Hemsley married boyfriend Andrew Armstrong it was like history repeating itself for both sets of parents – as they had all married in the same church. Laura (27) and Andrew (26), who live in Nottingham, were married at St Leonard’s Church, in Wollaton – the very same church both their parents had tied the knot in, 30 years earlier. The wedding was very much a family affair for the couple with Andrew’s great grandmother’s wedding ring being past down to Laura and the four-tier cake made by his talented mum. 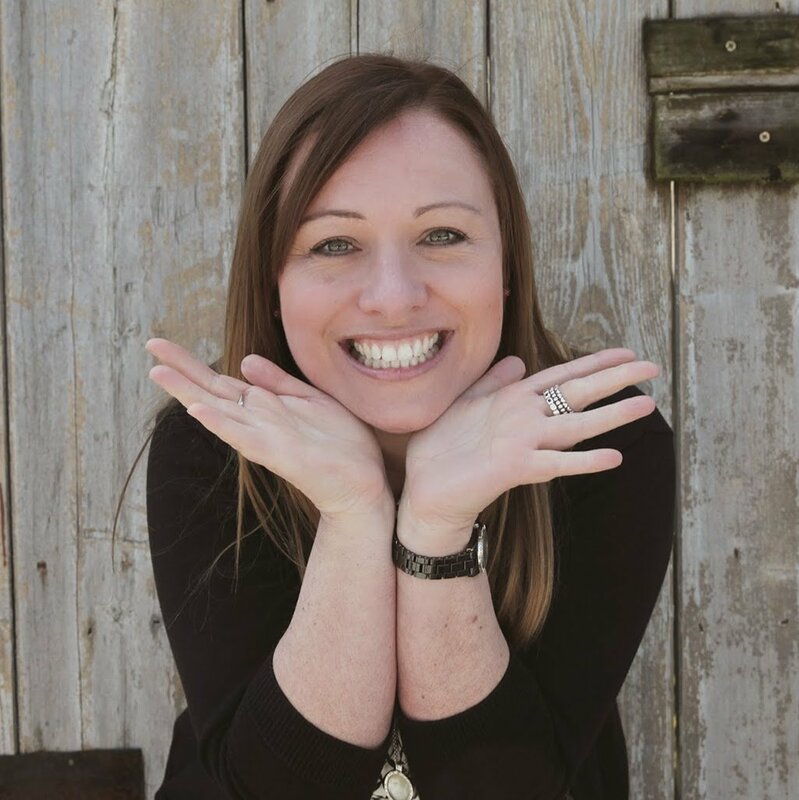 Here Laura, who works in marketing, talks us through their big day. Proposal: We went to London in 2011 just before Christmas and were planning on going to Hyde Park’s Winter Wonderland. We got off the tube at Green Park and sat on a bench where, to my sheer amazement, Andy got down on one knee. Apparently he had already asked my parents and he had already bought me a ring – which at first I just thought was a joke ring! That was the first time I realised how good he was at keeping secrets – he later surprised me with a honeymoon I knew nothing about either. Laura and Andy outside Shottle Hall. Shottle Hall: We got back from London on the Sunday and had booked Shottle Hall by the Monday! Although we live in Nottingham, Andy works in Belper and we both love the area. 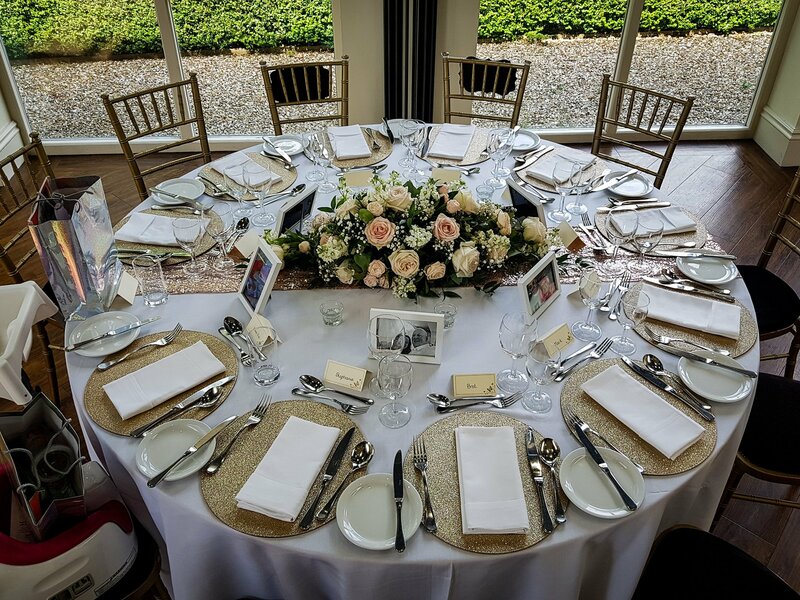 We looked at a couple of venues, but Shottle ticked all the boxes for us – we loved the exclusivity of the place and also that it had bedrooms which we meant our family could stay over too. Wedding date: December 15th, 2012. We had been to a friend’s wedding a few years before we were together (Andy took me as his plus one) and that was a Christmas wedding which we both thought was lovely – with the tree, twinkling lights and open fires. We got engaged in December and thought it would be perfect to marry at the same time of year. Dress: I always knew I wanted a lace, fishtail dress, something that looked very vintage and traditional. I found my perfect dress in New Bride, in Upper Parliament Street, in Nottingham. It was by an American designer called Maggie Sottero and I cried when I put it on. I took my mum with me and went back to try it on again with my bridesmaids. I also bought a fur stole from the same shop, for just £50. It was one they used to rent out, but they sold it to me for a bargain price. 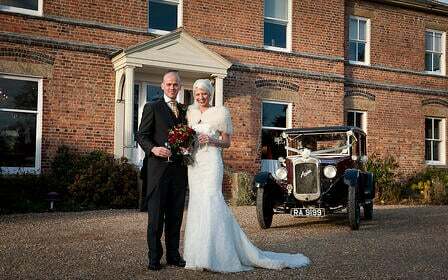 I really wanted a vintage cap veil to go with it and although I trawled the internet it took me ages to find one. Eventually I found a company that made vintage veils on etsy.com. I borrowed a garter that my mum had worn on her wedding day, which had a little horseshoe on it. Laura's bridesmaids wore red, inspired by the bride's engagement ring. Bridesmaids: My bridesmaids were my sister Jo and sister-in-law Kate. They wore Dessy dresses from New Bride which were nipped in at the waist and quite retro in style. I went for a ruby colour theme for the day, inspired by my engagement ring, and their dresses were in a beautiful ruby red. They also wore fur stoles to keep them warm. Groomsmen: The ushers were my brother Nick, and three of Andy's oldest friends Jamie, Stephen and Aidan. They wore morning suits from Formal Affair, on Maid Marion Way in Nottingham. The ushers, best man and both dad's wore ruby cravats and Andy wore gold. Hair and make-up: My sister Jo used to be an air hostess and so she’s really good at applying make-up, so she did mine, mum’s and Kate’s. I have a mobile hairdresser and she came over and did everyone’s hair. Flowers: I had my flowers from Sharpes Florist, in Bramcote Lane, in Wollaton. 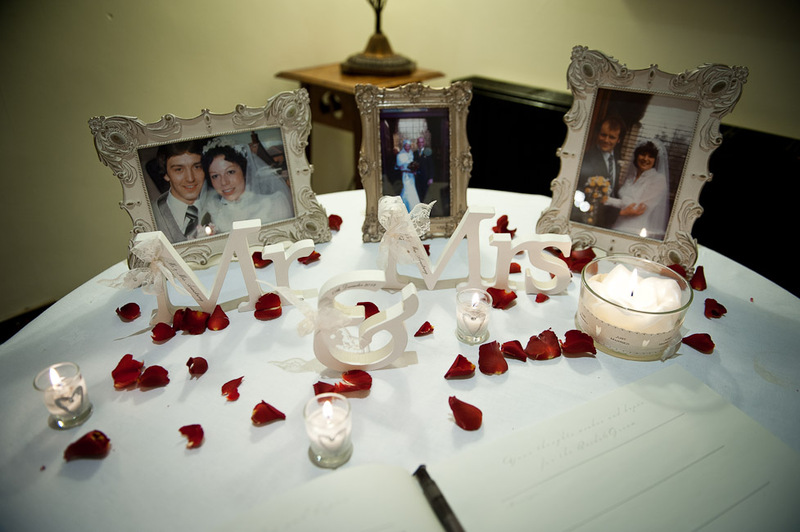 They actually did my mum and dad’s wedding flowers, so it was particularly nice to work with them. In my bouquet I had red roses, winter berries and alstroemeria with crystals and pearl loops. The bridesmaids had ivory roses, alstroemeria and red berries and the buttonholes were all ivory roses. Except Andy who had a red rose. My wedding ring was actually Andy’s great grandmother’s ring, which dates back to 1926 and is beautiful. Ring: Andy picked my engagement ring, which was absolutely perfect and exactly what I wanted. It is a ruby, with a diamond on either side, set in a gold band. I hadn’t told him exactly what I wanted, only that I would like a coloured stone, but he did really well as it is gorgeous. He got it from David Nidd Jewellers, in Belper. They were brilliant as when it had to be sent away to be sized they leant me another ring, so I didn’t have to be without one. We also got Andy’s wedding ring from there, which is a plain gold band. My wedding ring was actually Andy’s great grandmother’s ring, which dates back to 1926 and is beautiful. I also got Andy some ruby cufflinks for the big day, which were a wedding gift from me. The couple married in the same church as both sets of parents. Car: We had a vintage ruby red car to take us from the church to Shottle Hall. We hired it from T & L Vintage Cars who I actually found at Shottle’s wedding fair. It was a 1927 Austin Windsor, which was very noisy and bumpy and only went at about 40 miles an hour. But Andy told me all about our surprise honeymoon during the journey so it actually went quick as a flash. We drove through Belper as we wanted to wave at Andy’s colleagues who had all come out on to the pavement to watch us go past. Laura and Andy framed pictures of their parent's wedding days next to a framed picture of their own big day. Theme: I wanted a vintage and Christmassy theme – which was in keeping with the time of year and also the kind of style I like. But also, because my parents and Andy’s parents had all married at the same place, it was fitting to have a theme which also represented the past. I framed photographs of my parent’s wedding and Andy’s parent’s wedding and had them on a table at Shottle. I arranged for a friend to take a photograph of me and Andy outside church, nip off and get it printed, and then put it in a matching frame in between the other two. People were amazed we had turned it round so quickly, and it made a lovely talking point. 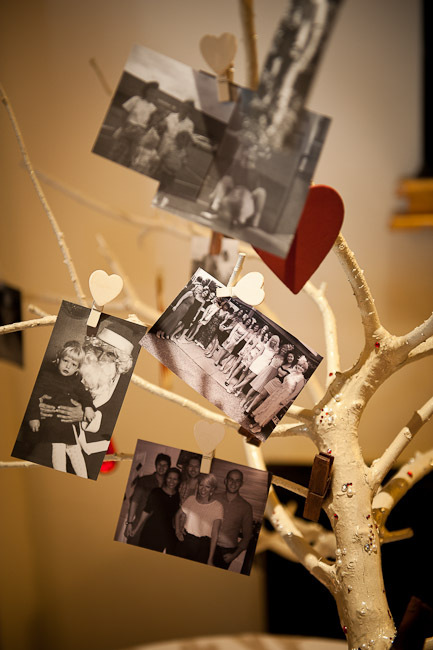 Laura put family photos on her 'wishing tree' which was made by her sister's boyfriend. Reception: We arrived at Shottle Hall at the same time as our guests and had champagne and mulled wine. We had 82 guests with us for the day. Our wedding breakfast was in The Orangery and we had pate to start with, a beef roast with Yorkshire puddings and then Bakewell Tart for pudding. We tried to choose lovely winter warming food, and it was really gorgeous. I bought some candlebras from weddingmall.co.uk for every table and as the room was quite dark by the time we sat down to eat it was lit by lots of candles which was perfect. I picked some fur cones off a tree in mum and dad’s garden, which made festive place name holders. Everyone was given a Christmas decoration as a favour which I had bought in June from dotcomgiftshop.com We had the speeches after the meal and my dad, Andy and the best man all said something. They fixed up a projector and a screen so there were lots and lots of embarrassing photographs. All the tables were names after Christmas phrases or songs such as Comfort and Joy or Baby, It’s Cold Outside. Best man: Andy’s brother Matthew was our best man. He actually got married seven weeks before us and Andy had been his best man. Apparently Matthew had to completely rewrite his speech after his wedding as it was very similar to the one Andy gave on his wedding day. Evening: We had 150 guests in the evening and music was provided by DJ Johnny Tour, who we had discovered at a friend’s wedding and really liked. We did our first dance to Take That’s Rule the World, and halfway through we invited our parents to join us on the dance floor. 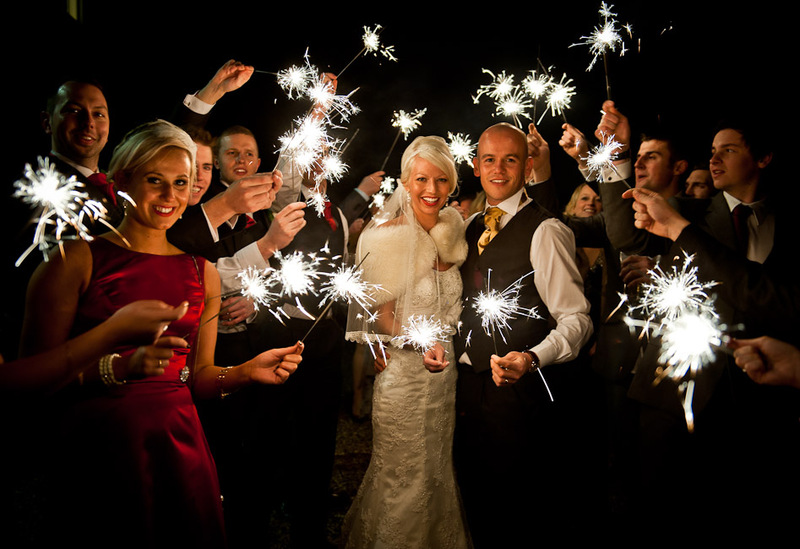 In the evening we had some sparklers, which my brother Nick had organised, which made for some stunning pictures and were lots of fun too. Andy's mum made the wedding cake. Cake: My mother in law made our wedding cake – she has done a course in wedding cake decorating, but she doesn’t actually do it for a living. 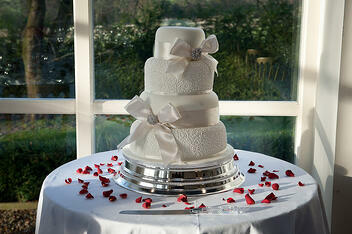 We had four tiers decorated with bows and brooches which matched the bridesmaid’s dresses. Photographer: We had Jon from Newton Photography who was absolutely brilliant. 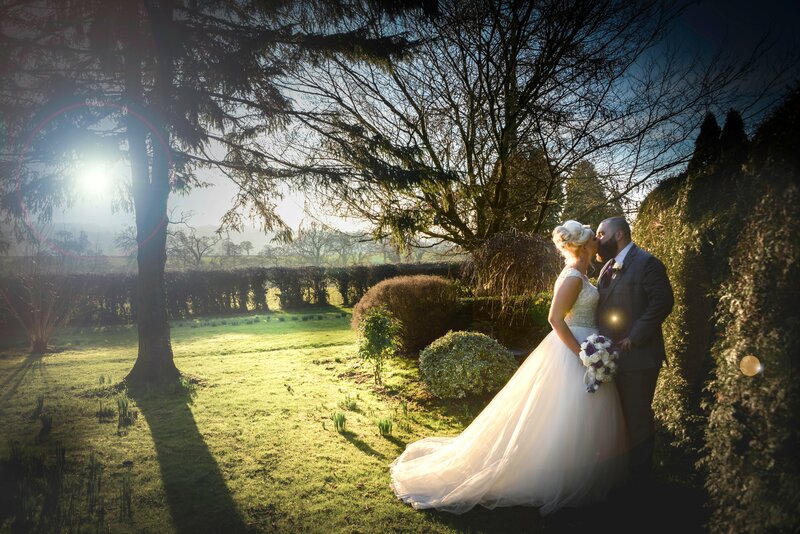 We were amazed with how many pictures he took and were stunned with some of his photographs – we have some amazing pictures of us with the sun setting. He delivered the pictures to us personally, which was a nice touch too. Jon had taken the photographs at Matthew’s wedding too and so it was nice to have someone we were already familiar with. 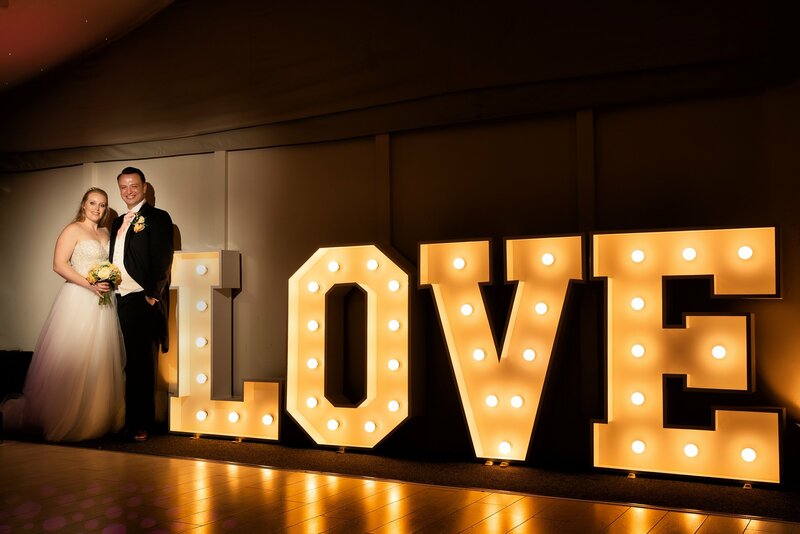 Videographer: Jon recommended Forever Films and we also had a friend with a video recorder who went around all the guests and asked them to describe the day in three words – so we had things like ‘absolutely bloody fantastic’ and ‘powerful’, ‘emotional’ and ‘amazing’. In the evening people were invited to leave little messages for us too, which are lovely to keep. Honeymoon: It took 50 minutes to drive from Wollaton to Shottle and it was during the car ride that Andy told me about our honeymoon. We had booked to go skiing in January, but Andy said he would book us a surprise which I assumed would be a little mini moon in the UK. In the car he gave me a book of laminated pieces of paper which he had tied together in a bow. Each one had a description of what we would be doing each day – so the first one said we were going to London and staying in the Park Lane Hotel. On Tuesday we would get a taxi to Heathrow and fly to New York! We stayed in the Waldorf Hotel and it was just amazing. New York at Christmas time is out of this world and it was such a surprise - it was fantastic.